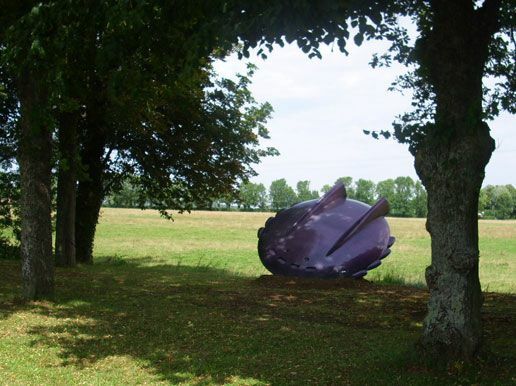 Another "crashed saucer", this one posing on the edge of a field in the French community of Vitteaux. The saucer is one of a series of identical sculptures crafted by Swiss artist Sylvie FLEURY. Photos of other specimens exhibited in less rural environments can be viewed at delius.egloos.com (Anyang, South Korea) and www.lexpress.fr (Toulouse, France). The saucer at Vitteaux also stars in a dramatic video that can be found at www.youtube.com. Our thanks to Manuel BORRAZ AYMERICH for calling our attention to this unusual piece of contemporary art.